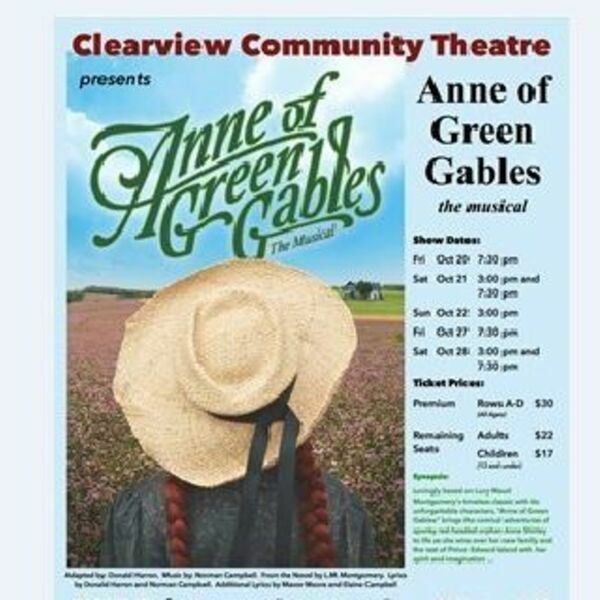 Description: To commemorate with Canada’s 150, Clearview Community Theatre is proud to present “Anne of Green Gables – the Musical” scheduled from October 20th to October 28th at the GNE Fairgrounds. Anne of Green Gables is a Canadian novel for all ages written by author, Lucy Maud Montgomery in 1908. The story is based on Orphan Anne Shirley who arrives in Avonlea by mistake, but she ultimately charms the entire town into falling in love with her precocious and imaginative mind, her passion and her heart. The musical by Harron and Campbell originated at the Charlottetown Festival on Prince Edward Island where it holds the record for the world’s longest running annual production. Clearview Community Theatre production will include 39 local artists all from the region ranging from children under 12 to adults. Joining Dianna on this BEACH CORNER from Clearview Community Theatre are Diane Crittenden, Ella Baker and Bryanna Vanderlek who will share the upcoming musical, their roles and involvement with the theatre company. Please enjoy & SHARE this great local program! To commemorate with Canada’s 150, Clearview Community Theatre is proud to present “Anne of Green Gables – the Musical” scheduled from October 20th to October 28th at the GNE Fairgrounds. Anne of Green Gables is a Canadian novel for all ages written by author, Lucy Maud Montgomery in 1908. The story is based on Orphan Anne Shirley who arrives in Avonlea by mistake, but she ultimately charms the entire town into falling in love with her precocious and imaginative mind, her passion and her heart. The musical by Harron and Campbell originated at the Charlottetown Festival on Prince Edward Island where it holds the record for the world’s longest running annual production. Clearview Community Theatre production will include 39 local artists all from the region ranging from children under 12 to adults. Joining Dianna on this BEACH CORNER from Clearview Community Theatre are Diane Crittenden, Ella Baker and Bryanna Vanderlek who will share the upcoming musical, their roles and involvement with the theatre company. Please enjoy & SHARE this great local program!